The Elementary School was chosen by Brooklyn Borough President to participate in a special celebration. Where can you find a growing Chinese population, a lively Chinese New Year celebration and a class of Little Kids Rock students in rooster masks? Brooklyn, of course! 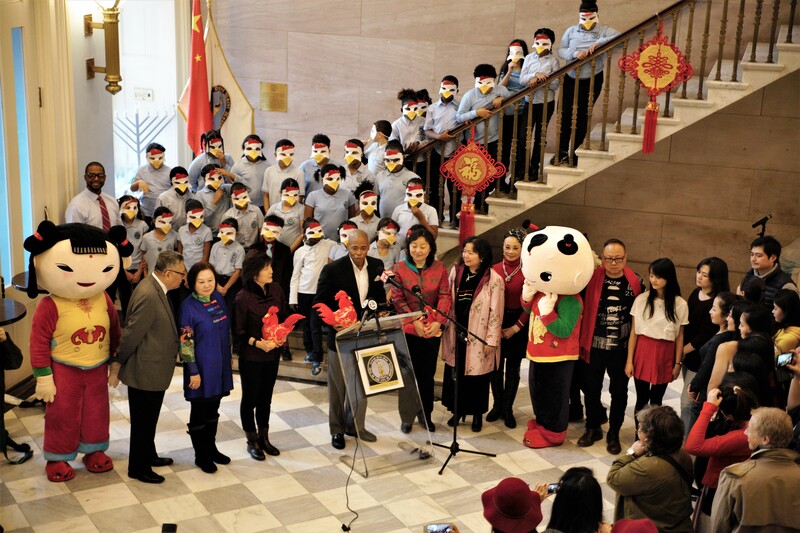 This Chinese New Year, the students of P.S.149K and their teacher Will Mosley were invited by the Brooklyn Borough Hall president to perform an authentic Chinese choreographed song & dance routine celebrating the year of the rooster. Our afternoon started with a ceremony orchestrated by members of the Chinese embassy where our students learned about Chinese culture and the sister city relationship between Brooklyn and Beijing. The student performance was then live-streamed all the way to Beijing! Gong Xi Fa Cai! Check out the New York City United Federation of Teachers Newspaper Cover Story HERE.